Shooting in Costa Rica was a true adventure. The rain was pouring, so my uniform was Tevas, swimming trunks, and a mesh shirt. The Canon 5D performed great in the inclement weather. I had brought the SD700 IS in its waterproof housing, but it wasn't the right camera for people shots. The 5D was the king of the day. In this podcast, I return home to catch up, share a few anecdotes, and get us all back on the right photography track. (I do make an error however and say that the photo assignment for Nov. is "water." That's wrong! The assignment is Light and Dark. Sorry about that. Still getting back in the groove. 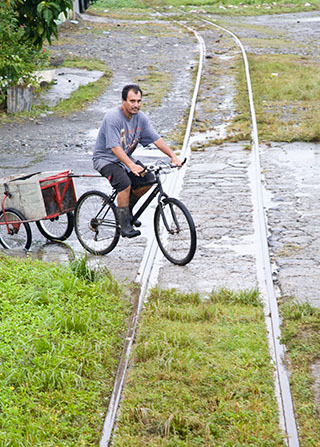 Costa Rican Cyclist -- by Derrick Story, captured with a Canon 5D, 24-105 mm L zoom, ISO 640, Cloudy WB, 1/250 @ f-6.7. You've really whetted my appetite describing your underwater shooting, especially the parrotfish. Will you be posting a gallery either here, Flickr, or both? I'm so fired up by your podcast that an underwater housing is going to be added to my online wishlist at the famous 2 initial photography retailer in Manhattan. Yes, I am going to post a snorkeling gallery. Should have a chance this weekend, then will point to it with a blog post here on TDS.